It is in the human nature to want to see and experience new places and distant lands, Okinawa Convention & Visitors Bureau, OCVB, and Ryukyu Broadcasting Corp, RBC, are jointly organizing a new fair this weekend specializing in travel (travel = tabi in Japanese). The aim of the fair is to inspire local people to travel and take tours, and to promote airlines. In the event, domestic and overseas airline companies and tour companies like Japan Airlines, All Nippon Airways and Okinawa Tourist Service will have booths where they introduce sightseeing options and local products of 23 cities within the country and 12 cities overseas that have direct flight connections to Okinawa. In addition to booths to give food for daydreaming, there are live mini concerts, events for children and delicious food samples from the travel destinations. The event takes place at the Okinawa Cellular Baseball Park in Onoyama, Naha, from 10:00 to 19:00 this Saturday and Sunday. Admission to the event is free. 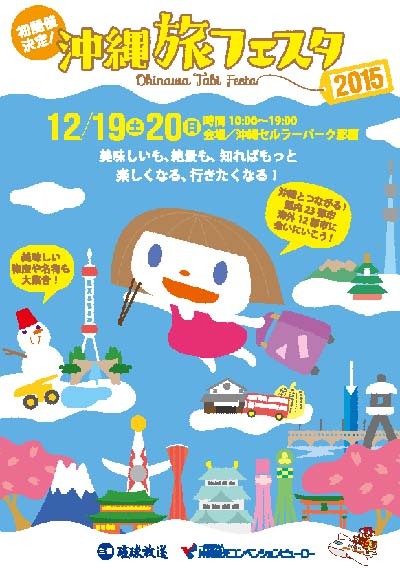 As there are no legal parking areas close to the Onoyama area, organizers of the Tabi Fest advise visitors to use public transportation to and from the venue.